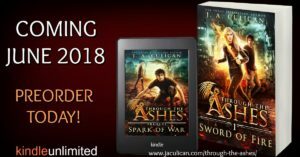 Home » Blog » Through the Ashes-Coming June 2018!!! Through the Ashes-Coming June 2018!!! Raise your hand if you already miss Cole and Eva?? (my hand just flew up, super fast!) I miss Keeper of Dragons sooo much already….but I have a whole new series coming out this June….which I hope you fall in love with just as much…..introducing….Jaekob and Bells!!! Jaekob…a dragon shifter….Bells a fae. This world was so much fun to build and I hope you all love my take on this dystopian fantasy!